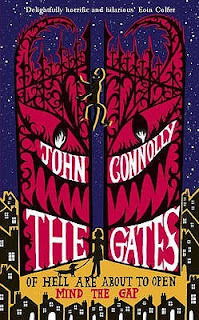 The Gates is a YA horror/fantasy by John Connolly. I didn't realize going into it that The Gates was YA, but since I happen to enjoy YA and any other "age group" really, I was good to go. First I want say that I love the entire dust jacket on this book. It's great. You might want to keep an eye out for a print copy. The story is pretty great, too. 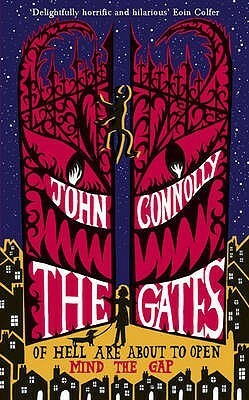 Here is where I confess this is my first John Connolly book. Is he always this humorous? I had a good time reading this. There's a lot of science (big bang, particle physics, what have you) to explain the gates of hell. At first I thought the science and the story weren't connecting very well, but once I realized how YA The Gates was, I thought it was perfect. So basically Samuel Johnson is out trick-or-treating early when he happens upon some folks who are summoning the devil and opening a gateway to hell. The Gates is a fun read. It's set during Halloween, it's full of scary neighbors and adults who don't listen, there's demons run amok and friends you can count on, and it's laugh out loud funny. I think I've read another book from him that was quite humorous as well, but can't recall off the top of my head. I really need to pick up the rest of this series. He really is a prolific writer and I believe he has a lot of books out. Glad you enjoyed this one. I love books that can take a dark subject and make it hilarious. I've not read one of his books yet but I'd like to. The Gates was full of some great stuff and is written in a light hearted manner than makes everything funny, even when Connolly is conveying complicated scientific processes.